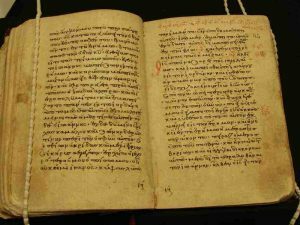 Greek ManuscriptThis is historical fact. After Christ’s ascension into Heaven, and after the Holy Spirit descended upon the first Christians at Pentecost, the Church thrived and grew exponentially for years before even one line of the New Testament was written. Let that sink in: Baptisms, catechesis, communal worship, conversions of thousands of sinners, Apostles and their companions traveling to other lands and risking imprisonment, torture, and death to evangelize the world with zeal — all went on for over a decade before the New Testament was even begun, much less completed. Eventually, a very few Apostles and their disciples starting writing down some of the Church’s oral Tradition: The Gospels, which recorded the life, death, and resurrection of Jesus, and also the Epistles (letters) of St. Paul and others, which gave encouragement and instruction to local churches being established throughout the world. The young Church cherished those gospels and letters, and began to incorporate them into her liturgies and masses. More and more written accounts and testimonies materialized as the Church grew, but contrary to today’s popular belief, it was not obvious to the early Christians which of these writings were truly God-inspired. The second group included books that were simultaneously accepted in some Christian regions, rejected in others, and disputed in others. Some of these were indeed divinely-inspired, such the Epistles of James and Jude, one of Peter’s, two of John’s, the Epistle to the Hebrews, and the Book of Revelation, even as many Christians did not believe they were. 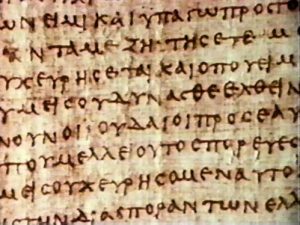 Some were books that never made it into the final canon of the New Testament, but which several Christian communities considered inspired (and even used for catechizing and in the liturgy), such as the Shepherd of Hermas, the Epistle of Barnabas, Apostolic Constitutions, the Epistle of St. Clement, St. Paul’s Epistle to the Laodiceans, etc. The third group consisted of the fakes floating around, spurious works which were never acknowledged or claimed by the Church, such as about 50 false gospels including the Gospel of Thomas and the Gospel of James, a couple dozen “Acts” (Acts of Pilate, Acts of Paul and Thecla, etc. ), and some epistles and apocalypses. Several books met those criteria, and so it happened that some four centuries and 20 generations after Christ’s Resurrection, the Magisterium of the Catholic Church authoritatively set the canon of the New Testament, ending all confusion and doubt among the faithful. 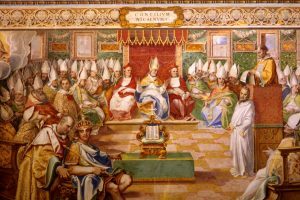 — If the Catholic Church (bishops and pope) had the authority from God to set the New Testament canon, then she cannot be the corrupt and un-Christian “Whore of Babylon” as is claimed by many Protestants. — If one accepts the canon of the New Testament, one must also accept the authority of the entity who gave it to us, i.e., the Catholic Church. — The New Testament cannot be “personally interpreted” by each individual Christian, because it was never meant to be taken outside of the Church from which it came. — The New Testament cannot and does not contradict Catholic doctrine, as it was Catholic doctrine that was used as a criterion for its authenticity and authority. — The New Testament was discerned and canonized by men who had divine authority to do so — men who believed explicitly in the Mass, the Eucharist, the ministerial priesthood, Confession, Purgatory, veneration of Mary, infant baptism and infused grace, justification by faith and works, the Communion of Saints, etc., etc. — The Bible came from the Church. In other words, the Bible is Church-based, not the other way around. If you get this paradigm wrong, you get some messed-up theology. — If a Protestant uses Scripture to attack the Catholic Church, it’s like ripping off a man’s arm to beat him with it. Using a Catholic Book to beat up the Catholic Church makes no sense. — If you believe that your eternal salvation is based entirely on a Book, isn’t it important to know where the Book came from and who was given authority to proclaim it? Who meticulously copied, preserved, protected, and guarded it with their lives, and who ultimately vouched for the fact that it is indeed the written Word of God? Holy Writ canonized by the RCC, was made to CHANGE, to fit into , the Pagan Traditions! Thus, Baptized Christianity became the norm,for the Roman Church!